RECYCLING QUESTIONS? WE HAVE ANSWERS! Bristol Township contracts with Waste Management to provide automated trash, recycling, and bulk trash pickup service to residences in Bristol Township. Trash and recycling is collected once a week according to the schedule above. Trash, Recyclables, Yard Waste, and Bulk Waste are all picked up on the same day. As part of the program, all residential customers receive a 95-gallon green waste and 65-gallon blue recycling cart. The containers are the property of Bristol Township. Can I place additional trash bags next to the cart? No. All TRASH must be placed INSIDE the Township-issued waste carts. Trash left in bags on the ground or street will NOT be collected. These carts are the only containers to be used for the automated collection. In order to reduce collection costs and increase efficiency and safety, Bristol Township uses automated garbage and recycling collection trucks. Each driver operates a robotic arm to empty carts into the truck. As a result, bags or other items left outside the cart cannot be collected because there are no extra people on the truck to collect additional garbage. Any refuse not collected due to non-compliance must be removed from curbside by the resident by 10:00PM on the designated collection day. The resident will be responsible for proper disposal of refuse. What if one cart is not enough for our family's weekly trash? May I get a second one? Yes. 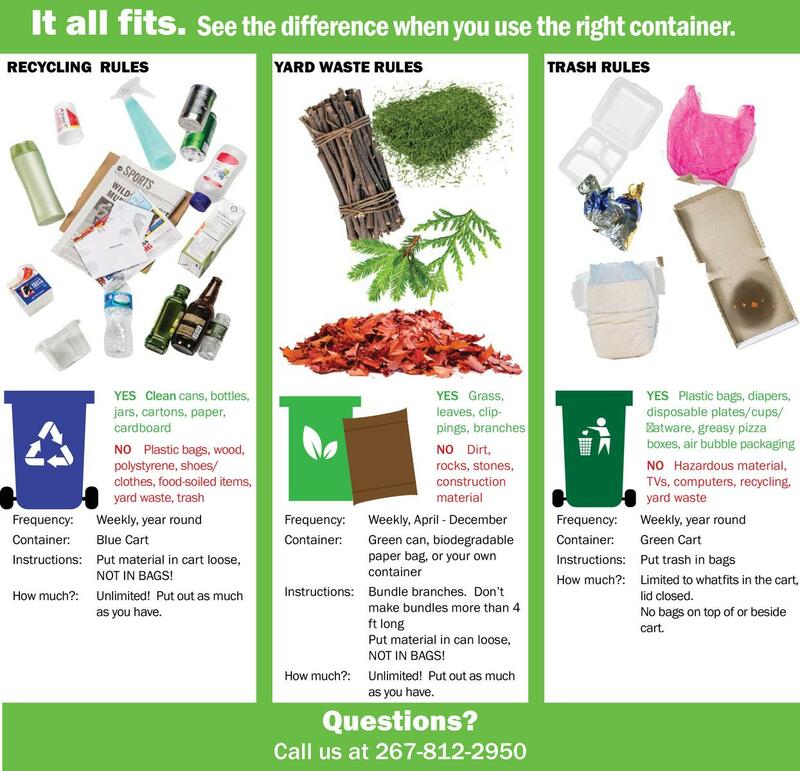 Please note that you must contact Waste Management directly at 800-869-5566 to purchase an additional trash container. The Township does not supply additional containers. I bought a cart at Home Depot that looks just like the ones we’ll be using. May I use it? No, the automated truck can ONLY pick up the containers approved by Bristol Township. Using a non-approved cart, other than the one provided by the hauler or township, will result in non-collection. What if all my RECYCLING will not fit into one cart? The above guidelines apply to TRASH only. Most households will find that recycling materials will easily fit into their cart. Crushing your bottles and cans, collapsing cardboard boxes and milk containers and compressing all materials will free up space so you can fit more in your recycling container. Since there is no limit to how much recyclable material may be placed out on each collection day, the Township recommends placing recyclable materials, such as cardboard, on top of the container for pickup should it not fit into the recycling container. One (1) Bulk Item can be placed out each week on your regular collection day. Examples of bulk items include mattress, washer, dryer, desk, etc. Bulk items CANNOT contain CFCs, HCFCs, Freon, refrigerants, or liquids. Township residents can schedule a courtesy pickup of an appliance containing Freon, CFC or HCFC, by calling Waste Management’s Customer Service at 800-869-5566. PLEASE NOTE THAT RESIDENTIAL RECYCLING IS REQUIRED BY ORDINANCE. Failure to comply with the guidelines above may result in the issuance of fines under the provisions of Chapter 134 Article II, 170-14 Municipal Waste Management at Residential Properties of Bristol Township Codified Ordinance. Your cooperation in following these guidelines above is greatly appreciated. Please place waste and recyclables in their proper carts, and close the lid. Place carts in the street, with wheels and handle toward the curb. Please allow 4 feet between carts, and away from trees, poles, cars, mailbox, etc. DO NOT RECYCLE food scraps, foam, automotive containers, plastic bags, or diapers! Please place all loose recyclables in your Blue Recycling Cart. No sorting is needed! Just place everything together in the cart. 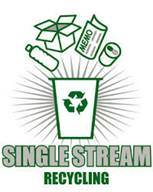 GET CAUGHT RECYCLING CAMPAIGN: Bristol Township rewards residents who recycle! Every month, two residents who are doing a great job recycling at home are randomly chosen to receive a $50 TD Bank Gift Card at the monthly Council Meeting. 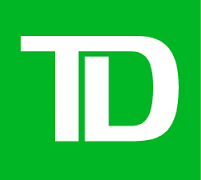 The campaign is sponsored by TD Bank. Get Caught Recycling and you may be the next winner! For more information call 267-812-2950. We ask that all solid waste, recyclables, and yard waste, be placed at the curb no later than 6 A.M. on the day of collection in order to ensure collection on that day. Any holiday that falls on a Monday through Friday, will cause all subsequent collection services for the week to be delayed by one day. For example, Friday service will occur on Saturday. Regular collection services will resume the following week. Yard waste can include: grass, leaves, clippings, branches, etc. Place yard waste in rigid container or biodegradable (paper) bags. No plastic bags. Branches must be cut into lengths less than 4 feet long. Branches should be tied or bundled with string or twine. Household hazardous wastes are not accepted. Toxic chemicals, pesticides, oil-based paints, weed killers, automotive batteries, fuels or fluids must be disposed of properly at a Household Hazardous Waste Collection event. Please check the Bristol Township website, Bucks County Recycling website, or call the PA DEP Recycling Hotline for locations and dates. Due to state law, we will not pick up for disposal any television, computer, laptop, printer, monitor, or any device which was connected to a computer. Residents may drop off small electronics for recycling at the outdoor electronics collection site at the Bristol Township Municipal Building . Call 267-812-2950 for information. Please call Waste Management at 1-800-869-5566 if you are experiencing problems with your pickup service or the Bristol Township Recycling Office at (267) 812-2950 if you have any questions or concerns. Any “commercial establishment” including stores, markets, offices, restaurants, shopping centers and theaters; any “industrial establishment” engaged in manufacturing or production including factories, foundries, mills and processing plants; and any “institutional establishment” or facility engaged in services, including hospitals, nursing homes, schools and universities are required by law to recycle. All commercial, industrial, institutional, and municipal establishments shall separate recyclable material from municipal waste. These establishments shall recycle corrugated paper, office paper, and aluminum containers. These establishments shall establish, implement, and manage a program for recycling of recyclable materials generated at their properties. Recyclable material shall be collected as often by generated volumes and environmental conditions, but not less than once a month. These establishments are required to submit a recycling report at such time as the Township may deem appropriate. All persons owning or managing multi-family housing properties shall establish, implement, and manage a program for the recycling of recyclable materials generated at their properties. All persons residing at multi-family housing properties shall separate recyclable material from municipal waste. Such recyclable materials include: glass bottle and jar containers; aluminum, steel and bi-metallic beverage and food cans; and newspapers. The owner or manager shall inform all persons residing at the multi-family housing property of the program, including the dates, times, and location of collection, the item to be recycled, and the method of collection. Such information shall be provided by the owner to all persons not less than once a year and to all new persons at the time of occupancy. Collection of recyclable shall be as often as required by generated volumes and environmental conditions, but not less than once a month. All multi-family housing properties are required to submit a recycling report at such time as the Township may deem appropriate. All persons owning or managing multi-family residential properties, commercial, institutional, industrial establishments shall separate leaf waste from municipal waste for processing at a composting facility. 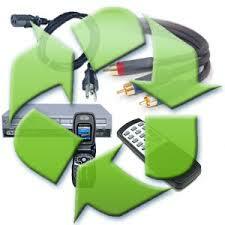 For more information on recycling contact Bristol Township at 267-812-2950.